Ninety-three million miles from Earth, our sun is 333,000 times the size of our planet. It has a diameter of 865,000 miles, a surface temperature of 5,600°C and a core temperature of 15,000,000°C. It is a huge mass of constant nuclear activity. Directly or indirectly, our sun provides all the power we need to exist and supports all life forms. The sun drives our climate and our weather. Without it, our world would be a frozen wasteland of ice-covered rock. Solar electricity is a wonderful concept. Taking power from the sun and using it to power electrical equipment is a terrific idea. There are no ongoing electricity bills, no reliance on a power socket: a free and everlasting source of energy that does not harm the planet! Of course, the reality is a little different from that. Yet generating electricity from sunlight alone is a powerful resource, with applications and benefits throughout the world. But how does it work? For what is it suitable? What are the limitations? How much does it cost? How do you install it? This book answers all these questions and shows you how to use the power of the sun to generate electricity yourself. Along the way, I will also expose a few myths about some of the wilder claims made about solar energy and I will show you where solar power may only be part of the solution. Although undoubtedly there are some significant environmental benefits of solar electricity, I will also be talking about where its environmental credentials have been oversold. I will keep the descriptions as straightforward as possible. There is some mathematics and science involved. This is essential to allow you to plan a solar electric installation successfully. However, none of it is complicated and there are plenty of short-cuts to keep things simple. The book includes a number of example projects to show how you can use solar electricity. Some of these are very straightforward, such as providing electrical light for a shed or garage, for example, or fitting a solar panel to the roof of a caravan or boat. Others are more complicated, such as installing photovoltaic solar panels to a house. I also show some rather more unusual examples, such as the possibilities for solar electric motorbikes and cars. These are examples of what can be achieved using solar power alone, along with a little ingenuity and determination. I have used one main example throughout the book: providing solar-generated electricity for a holiday home which does not have access to an electricity supply from the grid. I have created this example to show the issues and pitfalls that you may encounter along the way, based on real life issues and practical experience. A website accompanies this book. It has lots of useful information, along with lists of suppliers and a suite of online solar energy calculators that will simplify the cost analysis and design processes. The website is at www.SolarElectricityHandbook.com. If you simply want to gain an understanding about how solar electricity works then this handbook will provide you with everything you need to know. If you are planning to install your own stand-alone solar power system, this handbook is a comprehensive source of information that will help you understand solar and guide you in the design and installation of your own solar electric system. Solar has a big application for integrating into electrical products: mobile phones, laptop computers, portable radios. Even light electric cars can use solar energy to provide some or all of their power requirements, depending on the application. If you are a designer, looking to see how you can integrate solar into your product, this book will give you a grounding in the technology that you will need to get you started. If you are specifically looking to install a grid-tie system, i.e. a solar energy system that will feed electricity back into your local power grid, this book will provide you with a good foundation and will allow you to carry out the design of your system. You will still need to check the local planning laws and any other local legislation surrounding the installation of solar energy systems, and you will have to understand the building of electrical systems. In some countries, you specifically need to be certified in order to carry out the physical installation of a grid-tie system. If you are planning to install larger, commercial–size systems, or if you are hoping to install grid-tie solar systems professionally, then this book will serve as a good introduction, but you will need to grow your knowledge further. This book gives you the foundations you need in order to build this knowledge, but there are special skills required when designing and implementing larger scale solar systems that go far beyond what is required for smaller systems and are beyond the scope of this book. If you are planning your own solar installation, it will help if you have some DIY skills. Whilst I include a chapter that explains the basics of electricity, a familiarity with wiring is also of benefit for smaller projects and you will require a thorough understanding of electrical systems if you are planning a larger project such as powering a house with solar. I wrote the first edition of this book early in 2009. It is not a long time ago. Yet this 2012 issue is the sixth edition. In every edition, I have had to rewrite significant sections of the book and significantly update the website in order to keep up with the rapid pace of change. The rapid improvement in the technology and the freefall in costs since early 2009 have transformed the industry. Systems that were completely unaffordable or impractical just two or three years ago are now cost-effective and achievable. Solar panels available today are smaller, more robust and better value for money than ever before. For many more applications, solar is now the most cost-effective way to generate electricity. Over the coming years, all the signs are that the technology and the industry will continue to evolve at a similar pace. By 2015, solar will be the cheapest form of electricity generator, undercutting traditionally low-cost electricity generators such as coal-fired power stations. We are likely to see solar energy incorporated into more everyday objects such as laptop computers, mobile phones, backpacks and clothing. Meanwhile, solar energy is causing a revolution for large areas of Asia and Africa, where entire communities are now gaining access to electricity for the first time. As an easy-to-use and low-carbon energy generator, solar is without equal. Its potential for changing the way we think about energy in the future is huge. For families and businesses in rural African and Asian villages, it is creating a revolution. Solar electricity is produced from sunlight shining on photovoltaic solar panels. This is different to solar hot water or solar heating systems, where the power of the sun is used to heat water or air. Solar heating systems are beyond the remit of this book. That said, there is some useful information on surveying and positioning your solar panels later on that is relevant to both solar photovoltaics and solar heating systems. If you are planning to use solar power to generate heat, solar heating systems are far more efficient than solar electricity, requiring far smaller panels to generate the same amount of energy. Solar electricity is often referred to as photovoltaic solar, or PV solar. This describes the way that electricity is generated in a solar panel. For the purposes of this book, whenever I refer to solar panels I am talking about photovoltaic solar panels for generating electricity, and not solar heating systems. Deep in the centre of the sun, intense nuclear activity generates huge amounts of radiation. In turn, this radiation generates light energy called photons. These photons have no physical mass of their own, but carry huge amounts of energy and momentum. Different photons carry different wavelengths of light. Some photons will carry non-visible light (infra-red and ultra-violet), whilst others will carry visible light (white light). Over time, these photons push out from the centre of the sun. It can take one million years for a photon to push out to the surface from the core. Once they reach the sun’s surface, these photons rush through space at a speed of 670 million miles per hour. They reach earth in around eight minutes. On their journey from the sun to earth, photons can collide with and be deflected by other particles, and are destroyed on contact with anything that can absorb radiation, generating heat. That is why you feel warm on a sunny day: your body is absorbing photons from the sun. Our atmosphere absorbs many of these photons before they reach the surface of the earth. That is one of the two reasons that the sun feels so much hotter in the middle of the day. The sun is overhead and the photons have to travel through a thinner layer of atmosphere to reach us, compared to the end of the day when the sun is setting and the photons have to travel through a much thicker layer of atmosphere. 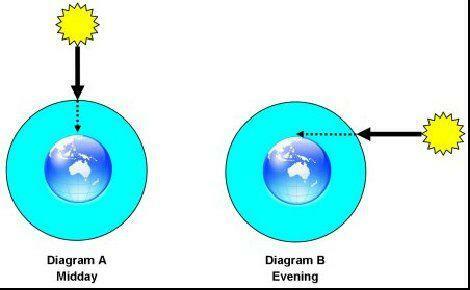 This is also one of the two reasons why a sunny day in winter is so much colder than a sunny day in summer. In winter, when your location on the earth is tilted away from the sun, the photons have to travel through a much thicker layer of atmosphere to reach us. A solar panel generates electricity using the photovoltaic effect, a phenomenon discovered in the early 19 century when scientists observed that certain materials produced an electric current when exposed to light. Two layers of a semi-conducting material are combined to create this effect. One layer has to have a depleted number of electrons. When exposed to sunlight, the layers of material absorb the photons. This excites the electrons, causing some of them to ‘jump’ from one layer to the other, generating an electrical charge. The semi-conducting material used to build a solar cell is silicon, cut into very thin wafers. Some of these wafers are then ‘doped’ to contaminate them, thereby creating an electron imbalance in the wafers. The wafers are then aligned together to make a solar cell. Conductive metal strips attached to the cells take the electrical current. When a photon hit the solar cell, it can do one of three things: it can be absorbed by the cell, reflected off the cell or pass straight through the cell. It is when a photon is absorbed by the silicon that an electrical current is generated. The more photons (i.e. the greater intensity of light) that are absorbed by the solar cell, the greater the current generated. Solar cells generate most of their electricity from direct sunlight. However, they also generate electricity on cloudy days and some systems can even generate very small amounts of electricity on bright moonlit nights. Individual solar cells typically only generate tiny amounts of electrical energy. To make useful amounts of electricity, these cells are connected together to make a solar module, otherwise known as a solar panel or, to be more precise, a photovoltaic module. Solar power is a general term for generating power, whether heat or electricity, from the power of the sun. Solar energy refers to the energy generated from solar power, whether electrical or as heat. Solar electricity refers to generating electrical power using photovoltaic solar panels. Solar heating refers to generating hot water or warm air using solar heating panels or ground-source heat pumps. Solar power is a useful way of generating modest amounts of electricity, so long as there is a good amount of sunlight available and your location is free from obstacles such as trees and other buildings that will shade the solar panel from the sun. Solar experts will tell you that solar electricity is normally only cost-effective where there is no other source of electricity available. The amount of energy you need to generate has a direct bearing on the size and cost of a solar electric system. The more electricity you need, the more difficult and more expensive your system will become. If your requirements for solar electricity are to run a few lights, to run some relatively low-power electrical equipment such as a laptop computer, a small TV, a compact fridge and a few other small bits and pieces, then if you have a suitable location you can achieve what you want with solar. On the other hand, if you want to run high-power equipment such as fan heaters, washing machines and power tools, you are likely to find that the costs will rapidly get out of control. As I mentioned earlier, solar electricity is not well suited to generating heat: heating rooms, cooking and heating water all take up significant amounts of energy. Using electricity to generate this heat is extremely inefficient. Instead of using solar electricity to generate heat, you should consider a solar hot water heating system, and heating and cooking with gas or solid fuels. It is possible to power the average family home purely on solar electricity without making any cuts in your current electricity consumption. However, it is not cheap, and you will need a lot of roof space to fit all the panels! It is usually a good idea to carefully evaluate your electricity usage and make savings where you can before you proceed. Most households and businesses are very inefficient with their electrical usage. Spending some time first identifying where electricity is wasted and eliminating this waste is an absolute necessity if you want to implement solar electricity cost-effectively. This is especially true if you live in cooler climates, such as Northern Europe or Canada, where the winter months produce much lower levels of solar energy. In the United Kingdom, for instance, the roof of the average-sized home is not large enough to hold all the solar panels that would be required to provide the electricity used by the average household throughout the year. In this instance, making energy savings is essential. For other applications, a solar electric installation is much more cost-effective. For instance, no matter which country you live in, providing electricity for a holiday home is well within the capabilities of a solar electric system, so long as heating and cooking are catered for using gas or solid fuels and the site is in a sunny position with little or no shade. In this scenario, a solar electric system may be more cost-effective than installing a conventional electricity supply if the house is off-grid and is not close to a grid electricity connection. If your requirements are more modest, such as providing light for a lock-up garage, for example, there are off-the-shelf packages to do this for a very reasonable cost. Around £70–£100 ($110–$160) will provide you with a lighting system for a shed or small garage, whilst £200 ($300) will provide you with a system big enough for lighting large stables or a workshop. This is far cheaper than installing a conventional electricity supply into a building, which can be expensive even when a local supply is available just outside the door. Low-cost solar panels are also ideal for charging up batteries in caravans and recreational vehicles or on boats, ensuring that the batteries get a trickle charge between trips and keeping the batteries in tip-top condition whilst the caravan or boat is not in use. Why choose a solar electric system? Compared to other power sources, solar electric systems typically have a comparatively high capital cost, but a low ongoing maintenance cost. To create a comparison with alternative power sources, you will often need to calculate a payback of costs over a period of a few years in order to justify the initial cost of a solar electric system. On all but the simplest of installations, you will need to carry out a survey on your site and carry out some of the design work before you can ascertain the total cost of installing a photovoltaic system. Do not panic: this is not as frightening as it sounds. It is not difficult and I cover it in detail in later chapters. We can then use this figure to put together a cost-justification on your project to compare with the alternatives. Wind turbines can be a good alternative to solar power, but probably achieve their best when implemented together with a solar system: a small wind turbine can generate electricity in a breeze even when the sun is not shining. Small wind turbines do have some disadvantages. Firstly, they are very site-specific, requiring higher than average wind speeds and minimal turbulence. They must be higher than surrounding buildings and away from tall trees. If you live on a windswept farm or close to the coast, a wind turbine can work well. If you live in a built-up area or close to trees or main roads, you will find a wind turbine unsuitable for your needs. Compared to the large wind turbines used by the power companies, small wind turbines are not particularly efficient. If you are planning to install a small wind turbine in combination with a solar electric system, a smaller wind turbine that generates a few watts of power at lower wind speeds is usually better than a large wind turbine that generates lots of power at high wind speeds. Fuel cells can be a good way to supplement solar energy, especially for solar electric projects that require additional power in the winter months, when solar energy is at a premium. A fuel cell works like a generator. It uses a fuel mixture such as methanol, hydrogen or zinc to create electricity. Unlike a generator, a fuel cell creates energy through chemical reactions rather than through burning fuel in a mechanical engine. These chemical reactions are far more carbon-efficient than a generator. Fuel cells are extremely quiet, although rarely completely silent, and produce water as their only emission. This makes them suitable for indoor use with little or no ventilation. Grid-tied solar electric systems connect directly into the electricity grid. When the sun is shining during the day, excess electricity feeds into the grid. During the evening and night, when the solar panels are not providing sufficient power, electricity is taken from the grid as required. Grid-tied solar electric systems effectively create a micro power station. Electricity can be used by other people as well as yourself. In some countries, owners of grid-tied solar electric systems receive payment for each kilowatt of power they sell to the electricity providers. Because a grid-tied solar electric system becomes part of the utility grid, the system will switch off in the event of a power cut. It does this to stop any current flowing back into the grid, which could be fatal for engineers repairing a fault. Once installed, a solar electric system is a low-carbon electricity generator: the sunlight is free and the system maintenance is extremely low. There is a carbon footprint associated with the manufacture of solar panels, and in the past this footprint has been quite high, mainly due to the relatively small volumes of panels being manufactured and the chemicals required for the ‘doping’ of the silicon in the panels. Thanks to improved manufacturing techniques and higher volumes, the carbon footprint of solar panels is now much lower. You can typically offset the carbon footprint of building the solar panels by the energy generated within 2–5 years, and some of the very latest amorphous thin-film solar panels can recoup their carbon footprint in as little as six months. Therefore, a solar electric system that runs as a complete stand-alone system can reduce your carbon footprint, compared to taking the same power from the grid. It is therefore much more difficult to put an accurate environmental payback figure on grid-tied solar systems. It is undeniably true that some people who have grid-tied solar power actually make no difference to the carbon footprint of their home. In colder climates, the majority of electricity consumption is in the evenings and during the winter. If you have grid-tie solar but sell most of your energy to the utility companies during the day in the summer and then buy it back to consume in the evenings and in the winter, you are making little or no difference to the overall carbon footprint of your home. In effect, you are selling your electricity when there is a surplus and buying it back when there is high demand and all the power stations are working at full load. In warmer climates, solar energy can make a difference. In a hot area, peak energy consumption tends to occur on sunny days as people try to keep cool with air conditioning. In this scenario, peak electricity demand occurs at the same time as peak energy production from a solar array, and a grid-tie solar system can be a perfect fit. If you live in a colder climate, this does not mean that there is no point in installing a grid-tie solar system. It does mean that you need to take a good hard look at how and when you consume electricity. Do not just assume that because you can have solar panels on the roof of your house, you are automatically helping the environment. There is an online calculator that will allow you to map your electricity usage over a period of a year and compare it with the amount of sunlight available to your home. Designed specifically for grid-tie installations, this calculator allows you to see how close a fit solar energy is in terms of supply and demand. Whilst this online calculator is no substitute for a detailed electrical usage survey and research into the exact source of the electricity supplied to you at your location, it will give you a good indication of the likely environmental performance of a solar energy system. To use this online calculator, you will need to collate information about your electricity usage for each month of the year. You will usually find this information on your electricity bill or by contacting your electricity provider. Then visit www.SolarElectricityHandbook.com, follow the links to the Grid-Tie Solar Calculator in the Online Calculators section and fill in the online questionnaire.